I will be offering a series of one-of-a-kind jewelry kits utilizing favorites from my bead stash--open-ended projects without directions. No. 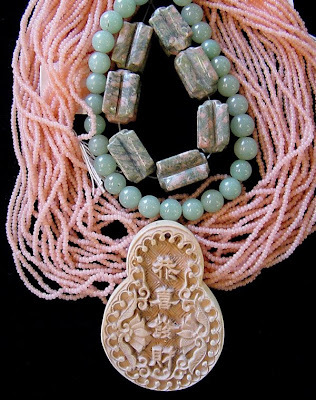 1 includes two hanks (total of twenty-four 20-inch strands) of size 11/0 carnelian alabaster czech seed beads, one 16-inch strand of 8mm round Burma Jade gemstone beads, seven 11x19mm fancy carved Unakite accent beads (from my stash) all set off by an antique white 63x45mm resin pendant which is drilled front to back near the top. I recently made what amounts to an official apology on my jewelry home page. It is so underdeveloped and neglected. 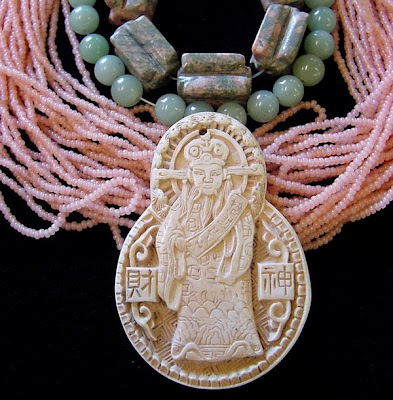 It has featured forever the same triple strand necklace (sold long ago) of turquoise and coral--one of my favorites. The photo serves to remind me to make more like it. I have made a promise there as well. So this weekend I will make good on that promise. Even this very morning, unless I get diverted! 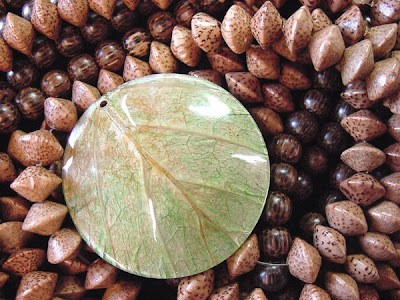 Palmwood saucers and Old Palmwood round beads set off a Coco Leaf inlay pendant. Cool White wood wheels, Black wood fluted ovals, White wood 10mm rounds, and Tiger Ebony wheels (above). 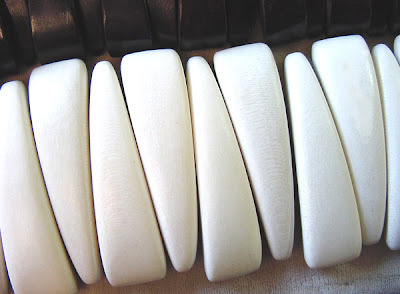 White wood tapered triangles come in 8-inch bracelet lengths. 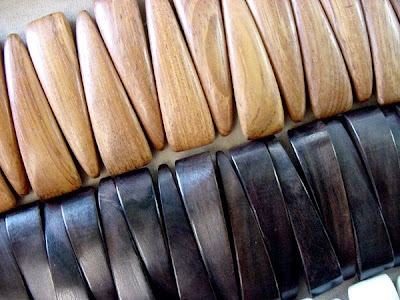 All wood bracelet lengths, shown above in Bayong and Black Ebony, are double drilled. 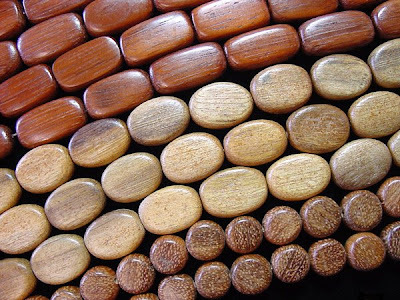 Flat wood shapes (above) include rounded rectangles of Bayong, Nangka ovals, and puffy Bayong coins. Vine wood in 20-inch loops of tiny tubes, and 16-inch strands of cross-drilled sticks (above). I love the look of wood for summer. 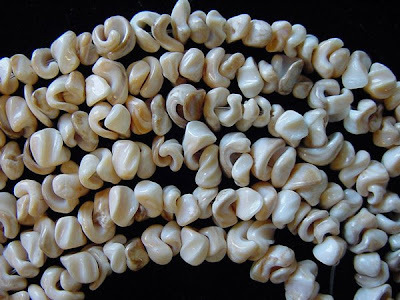 It blends well with other natural beads like shell, bone and horn, making a bold statement without a lot of weight. 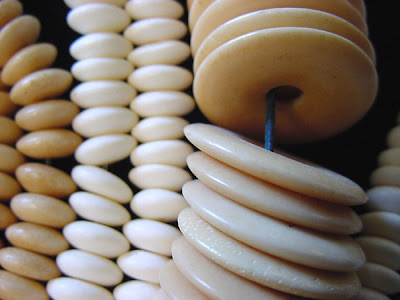 Tea-dyed and white rondelles with a strand of donut discs (above). Donuts are 25mm with a 8mm hole. 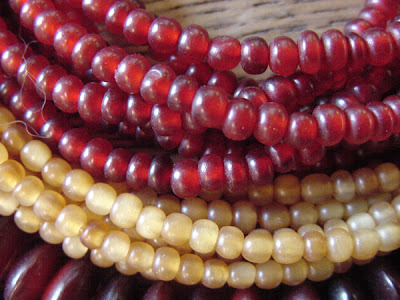 Red and golden horn spacer beads (above). Red horn rondelles and golden horn squared nuggets (above). 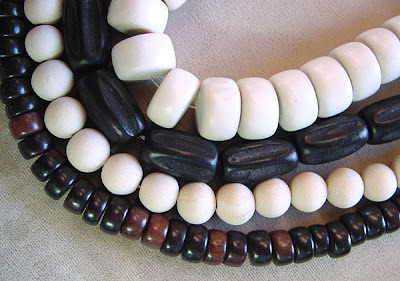 These new bone and horn additions to Anita's Beads will add interest to your summer designs. 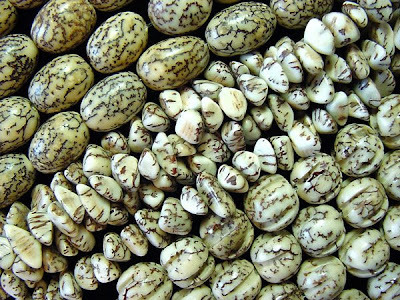 New shapes in Salwag, also known as Betel Nut (above). 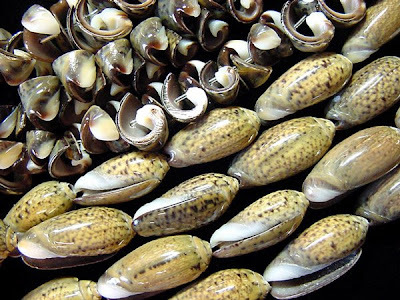 Close-up of the fluted round salwag beads (above). Buri (with skin) in multi-colored nuggets mixed with assorted round buri beads (above). Round buri (mist green and natural with skin) and black buri coin beads provide a backdrop for our new Coco Leaf pendants (above). 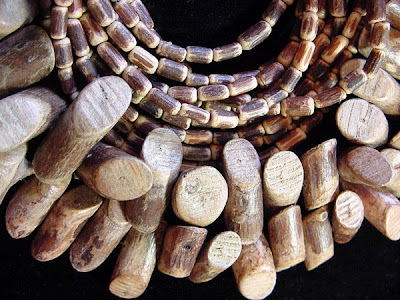 Above are some new buri, and salwag beads. I absolutely love the Coco Leaf inlay pendants. So green, so summer! 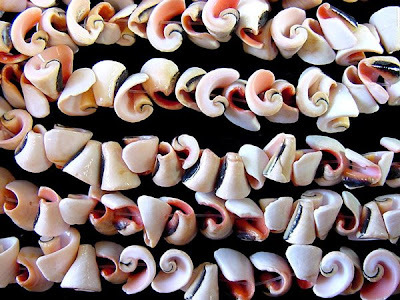 Popcorn or Everlasting shell curls (top) and Pink Conus shell beads (above). 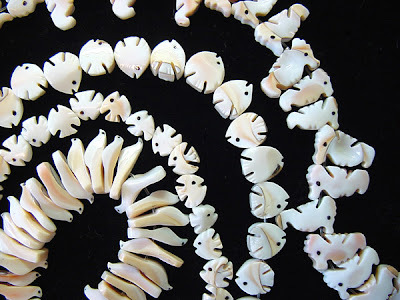 Carved shell fetish beads: birds, small fish, large fish, and seahorses (above). 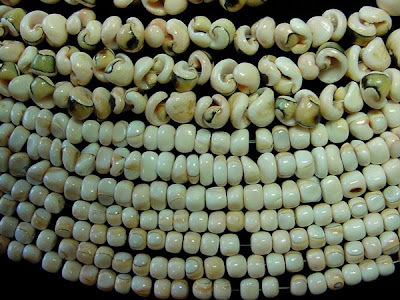 Clam shell heishi (top) and polished Troka shell beads (above). 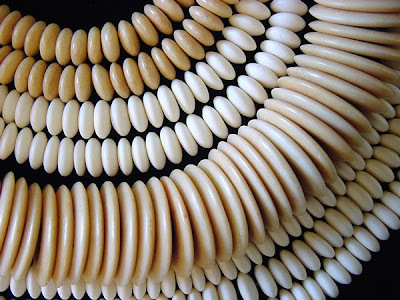 Kebe shell strands in flat dimes and heart shapes (above). Choco Orchard regular (top) and twisted (above). 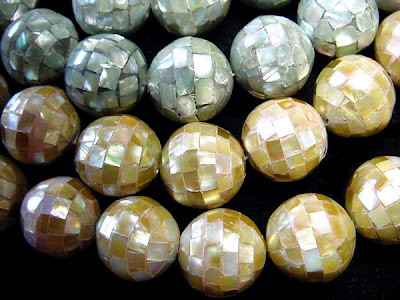 Inlay focal beads of green lip (top) and gold lip shells measure 18mm (above). 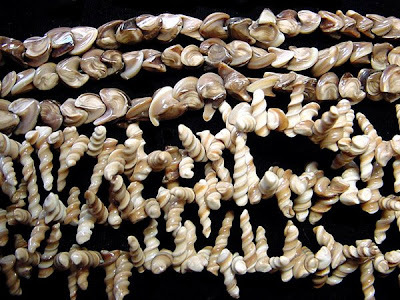 Olive Shell curls(top) and whole shell beads (above). 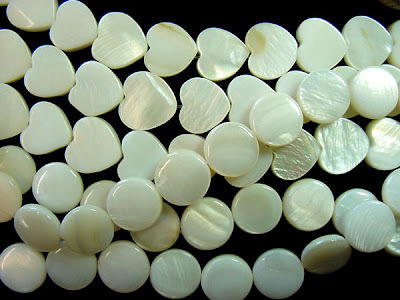 Just in time for your warm weather designs are these lovely shell beads. Stop in soon as supply is limited. 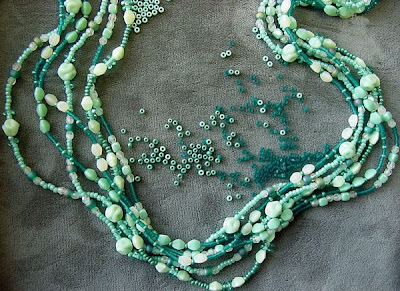 Here's another multi-strand necklace that I am stringing at the bead counter. I love this color combination. 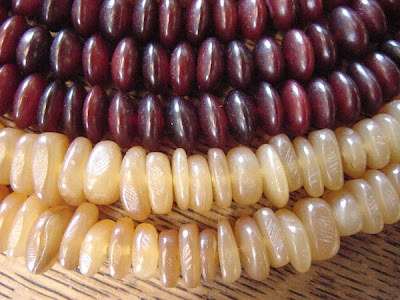 I'm using three colors of czech pinch beads, 4mm rondelles, 4mm czech cubes, 3mm czech firepolished faceted beads, four different colors of seed beads, and a few vintage ruffle beads. 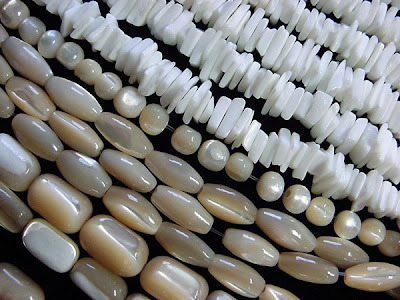 The gemstone Zuni Fetish beads pictured above are drilled from top to bottom and measure 20mm from nose to tail. 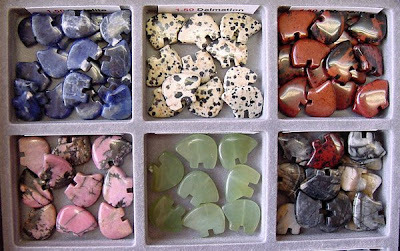 Stones in the top row are: Sodalite (left); Dalmation Stone (center); Mahogany Obsidian (right). 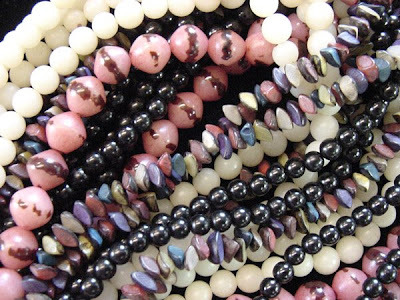 Stones in the bottom row are: Rhodonite (left); Serpentine (center) and Picasso Marble (right). 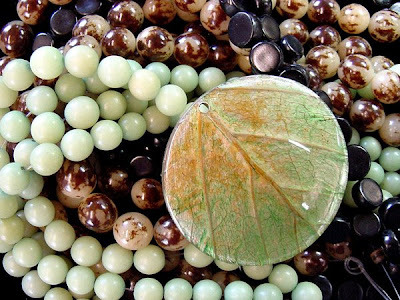 Pictured above in the top row are more 20mm Zuni Fetishes in the following stones: Tiger Eye (left); Goldstone (center); Moss Agate (right). 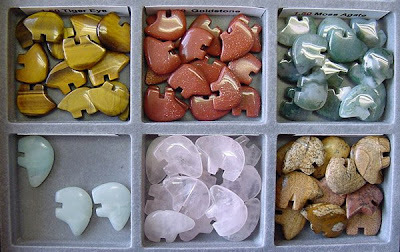 The ones in the bottom row are 25mm from nose to tail in: Amazonite (left); Rose Quartz (center); Picture Jasper (right). I took a nice ride down the back roads to Rochester, New Hampshire this morning (thanks for the lift, Trudy!) to the Monarch School of New England where I gave a table talk on rocks. It was hands-on for everyone. You can see what I brought in the photo above. I took basically as much as I could carry for a short distance! 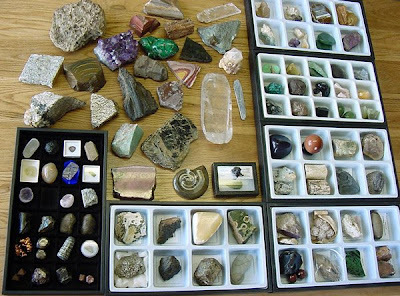 Topics included New England granite pegmatites and the gem minerals that can be found there, fossils, meteorites and tektites, the quartz family, and how I got started collecting minerals. 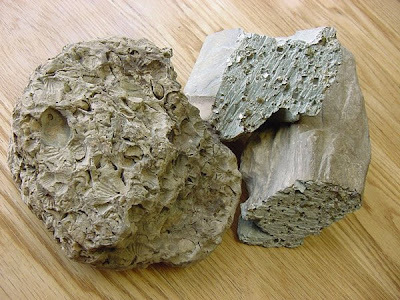 I even had my first fossil specimen collected(from Maine) and my first mineral specimen (pyrite, also from Maine) to hand around. The teachers enjoyed the rocks as much as the students and presented me with a gift certificate for flowers at 4J's Earthworks on Old Wakefield Road near the Rochester-Milton town line. 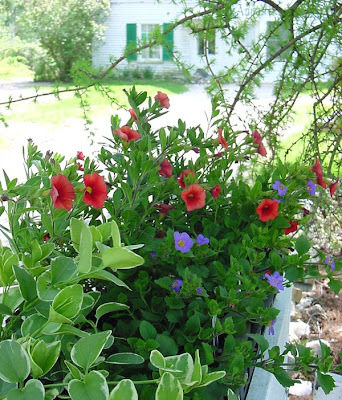 So on the way home I picked out these lovely flowers for my mailbox planter. So I have what I call my "Archive of Indecision" of unfinished bead projects (just like the one I have for collage art). My plan is by posting an item a week I will be encouraged to finish that item. Let's see how it goes. Today's item has only been languishing a week or two. 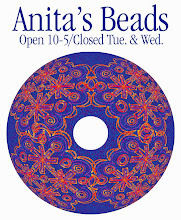 If you have been to the shop recently you probably have heard me talk about it at the bead counter. 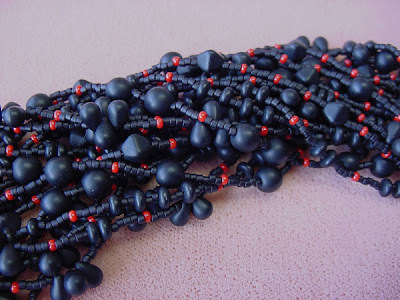 It's a 22-inch multi-stranded necklace of assorted matte jet black czech glass beads: 4mm rondelles, 6mm druks, 6mm bicones and 4x6mm teardrops. They are separated by matte jet Japanese size 11 Delica seed beads with a sprinkling of red czech seed beads for the zinger. 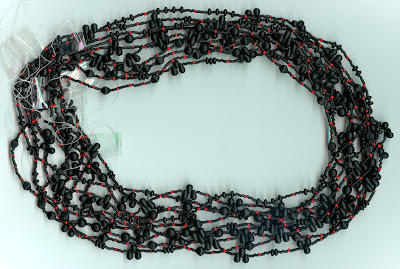 The necklace of 10 strands will end off in cones. I strung it on 10# Power Pro cord using a size 10 Soft Touch needle. I'm not happy with the scanned photo above so I tried again with the camera. The picture below shows the strands doubled up and then twisted. I like the fullness so maybe I need to string 10 strands more. 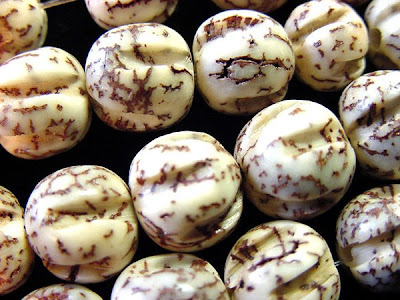 Every once and a while I blog about my beads over at AnitaNH: Collage and Life, my web log about collage and multimedia art. But I feel inhibited by the thought that readers there expect art talk rather than bead talk. 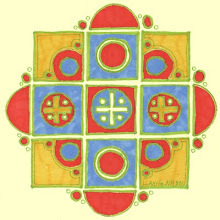 So this will be my new place for talking about beads and the jewelry I am designing with them.